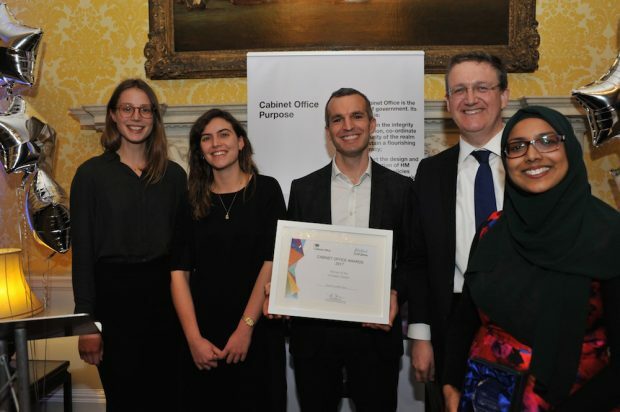 Here's a picture of our team winning the Cabinet Office Innovator Award in 2017. From left to right: Sophia and Rosa, two of our PhD placements, Chris Webber, head of our team, Rupert McNeil, Civil Service Chief People Officer, and Zahra Latif, who leads economic policy in the OIT. The pace of Whitehall is one of the reasons it's such an exciting place to work. But officials still get frustrated that they don’t have more time to engage with people outside the bubble. We know we don’t have all the answers, and that we’d have a better chance of identifying them if we were able to spend more time speaking to experts. That’s why the Cabinet Office has set up the Open Innovation Team, a new unit dedicated to deepening collaboration between officials and academics. Created in summer 2016, we work across Whitehall helping departments generate analysis and ideas for priority projects by collaborating with academics. We’re experimenting with different ways of improving links with academia, but our work normally falls into three main categories: engagement, which mostly means organising events that connect officials and academics, research, where we partner with academics to produce tailored research for Whitehall teams, and policy, where we collaborate with academics to develop policy proposals. Our first 18 months could hardly have been busier, with projects on mental health, economic growth, childcare, education, food standards, housing and environmental sustainability all in the mix. One of our biggest workstreams is digital transformation, where we’ve set up a Digital Government Partnership that brings academics into Whitehall as Technology Fellows to help us experiment with emerging technologies. Our first Tech Fellow has already been in post for six months, helping us develop thinking on the policy applications of blockchain, and we’re scoping similar projects in other areas, including robotic process automation, human computer interaction and data scraping. Probably the most novel feature of our approach is that we're not funded by government. All our staff and project costs are covered by four university partners – Bath, Lancaster, Southampton and Warwick – who are each contributing £125,000 over two years. We obviously have a close relationship with these partners, but it's not exclusive – we’re free to work with any university or other outside expert as we wish, and we frequently do. Another unusual feature of our approach is our use of PhD students. We discovered last year that many PhD students have funding to work with us on placements of 3 to 6 months, so we’ve been inviting them to apply and busily tapping into a gold mine of some of the most talented students in the country. They’ve been a fantastic addition to our team, greatly increasing our capacity and bringing new skills and perspectives at the same time. All in all, it’s been a tremendously promising start for the Open Innovation Team. And with our pilot phase due to come to an end in September, we’ve just had the go-ahead to scale up the team in phase two. More on that in the next month or so. Great idea! What's the process for sharing expertise? I'm Communication Officer for iCASP a NERC funded Regional Impact from Science of the Environment Programme developing integrated catchment management approaches in Yorkshire. We're working with businesses, policy bodies and other actors contributing to economic development to achieve huge pay-offs in terms of flood protection, carbon sequestration, etc. We have lessons to share that could benefit all of the UK and of relevance to Defra's 25 year Environment Plan. Hi Susan, thanks for getting in touch. Could you email openinnovation@cabinetoffice.gov.uk and we'll try and put you in touch with the relevant Defra officials?